Inspired by a real-life survival story, Adrift is a watery yarn that hinges on a narrative sleight-of-hand liable to capsize some people's enjoyment of an otherwise well-crafted film. Arriving late on, that twist won't be revealed here, but it's enough to make you rethink the whole movie. Until then, Shailene Woodley manages a convincing impression of a woman desperately fighting Mother Nature in a storm-battered yacht in the Pacific Ocean. 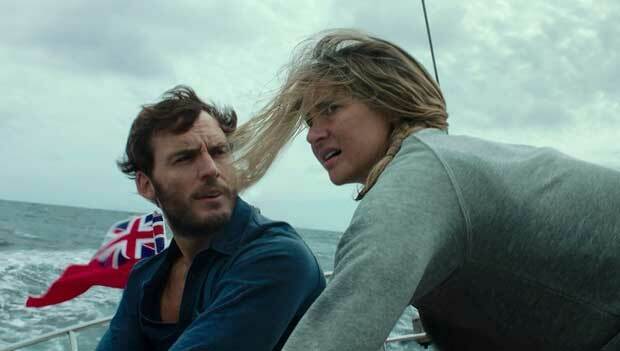 Beginning as her character Tami regains consciousness to find the boat in bits and water seeping in, the film then starts flashing back, as this 23-year-old traveller arrives in Tahiti and meets Richard (Sam Claflin), an experienced British sailor who built his own boat in South Africa. Romance swiftly blooms, but plans change when Richard gets a handsomely paid job offer to sail a couple's yacht back to San Diego. After some hesitation, Tami joins him – although given the life or death situation they soon face, she'll maybe wish she hadn't. Directed by Baltasar Kormákur, who made the mountaineering drama Everest, the film is a fine showcase for Woodley, who is tested far more here than she was in the Divergent series. The survival stakes are ramped up, as Tami and Richard face injury, food and water shortages, and the very real possibility of being lost at sea. Adapted from Tami Oldham Ashcraft's memoir, the film rather pales next to the Robert Redford-starrer All Is Lost, which told a similar tale of mankind-versus-nature with far more economy and potency. But what does work is the chemistry between Woodley and Claflin, who convincingly convey that first flush of romance. Like any good date movie, their belief in each other is what keeps you watching. Tami (Woodley) wakes up in her yacht to find water seeping into it, and she and boyfriend Richard (Claflin) must work together to save it. Woodley and Claflin convincingly convey that first flush of romance and it’s a real-life survival story with a twist which may spoil some people’s enjoyment.